Elmer McCollum and Marguerite Davis were responsible for the discovery of “fat-soluble A” (which was eventually resolved into vitamins A, E, D, and K), and E. B. Hart and Harry Steenbock confirmed that iodine can alleviate goiter. These two important scientific achievements, as well as the stories, personalities, and even controversies that accompanied them, changed the field of biochemistry at UW–Madison and around the world. The department’s work with vitamins began with what is called the single grain experiment with cows from 1907-1911. The experiment, done by Stephen Babcock, Hart, McCollum, and Steenbock, fed groups of cows only a single grain, either corn, wheat, or oats, and then a last group a combination of all three. They found that the cows that ate corn were healthier than the others. This finding told the researchers there was something essential in corn that wasn’t present in wheat or oats and they began supplementing the other two with different additions, like parts of milk, to find what would make a diet complete. To further develop the experiment, McCollum asked his dean if he could have some money to study rats instead of cattle because it would be cheaper and produce better results. In a funny twist in the story, McCollum was laughed out of the office. Rats were a nuisance on Wisconsin farms, causing thousands of dollars in damage each year. “If the farmers of this state ever figured out that the dean was spending their taxes to learn how to nourish rats there would be trouble,” the dean reportedly told McCollum as he denied his request. Dave Nelson, a Biochemistry Emeritus Professor and defacto department historian, recounted these historical conversations at a recent lecture for Wednesday Nite at the Lab. Instead McCollum drove to Chicago to buy some mating pairs of white rats, and Wisconsin actually became a leading breeder of rats used as model organisms in science in a short time. Using these experiments in cattle and rats, McCollum and Davis found that there were components in milk that were extremely potent and fixed the insufficient diet. They described two fractions, fat soluble A (which was eventually resolved into vitamins A, E, D, and K), and water-soluble B (eventually shown to consist of vitamins B1, B3, B6, and B12). Conrad Elvehjem and coworkers discovered that tiny amounts of niacin (vitamin B3) cure “black tongue” disease in dogs, thought to be the canine equivalent of pellagra in humans. Niacin was quickly shown to cure pellagra in humans. This finding resolved the debate about whether pellagra was due to a nutritional deficiency in some foods or to toxins present in certain foods. This was coupled with research during this time from the United States Public Health Service. At about the same time, scientists in the Department of Agricultural Chemistry (which later became the Department of Biochemistry) discovered that the disease goiter is caused by a lack of iodine in the diet. Because iodine is an essential part of the thyroid hormone, its absence from the diet causes excessive growth of the thyroid gland — the disease goiter. Nelson explains that seafood provides a lot of iodine since the ocean is rich in the element. Before the advent of refrigerated transport of seafood, goiter was uncommon on the East and West Coasts, but common in the Midwest. In 1917, Hart and Steenbock confirmed this link between iodine and goiter. In 1939, Hart and colleagues also devised a way to get iodine into people’s everyday diet. The solution was to add trace amounts of iodine to the ubiquitous staple in every kitchen — table salt. Iodized table salt is still in use today. These two discoveries and the department’s work in vitamins are just one example of the ground-breaking research that exemplifies the department’s history and makes up the modern research occurring today. The top left thumbnail is a photo by Robin Davies of Harry Steenbock depicted in murals by John Steuart Curry that are located in the Hector F. DeLuca Biochemistry Building. 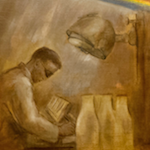 The murals showcase the societal benefits of biochemistry.